In November 1910, a young Maori, Ruruku Aranui was chasing wild pigs that had strayed into a local reserve. His dog chased a pig down a steep hill and the pig suddenly disappeared and so too did the dog. The dogs barking led Ruruku to a small hole in the side of the hill. He then crawled inside and with a match found them both in a high chamber that continued into the darkness. Ruruku Aranui went to Waitomo and told the manager in charge of the caves. They both then re-entered the caves exploring it further, absolutely fascinated by its great beauty. 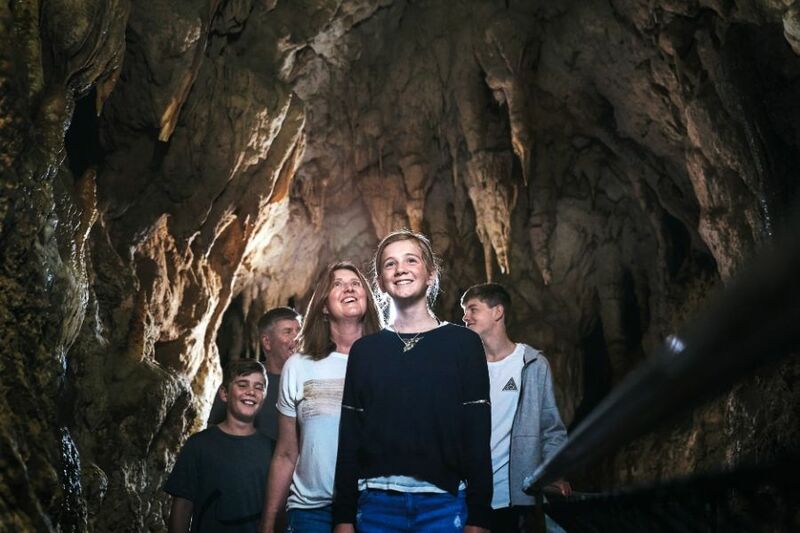 The discovery of a new cave in Waitomo caused much excitement around the country. The cave was much easier to develop than the Waitomo Glowworm Caves, and in just over a year it was ready for tours. In February 1911, there was an official opening by the Minister of Tourism. Originally the cave was to be called Ngutuhihi (the beak of the stitch-bird), but because pronunciation was difficult, it was decided by the Minister to name it Aranui Cave. Aranui Cave is one of the most richly decorated caves in Waitomo. There is very little of the ceiling in this cave that has not been decorated by the dripping water.